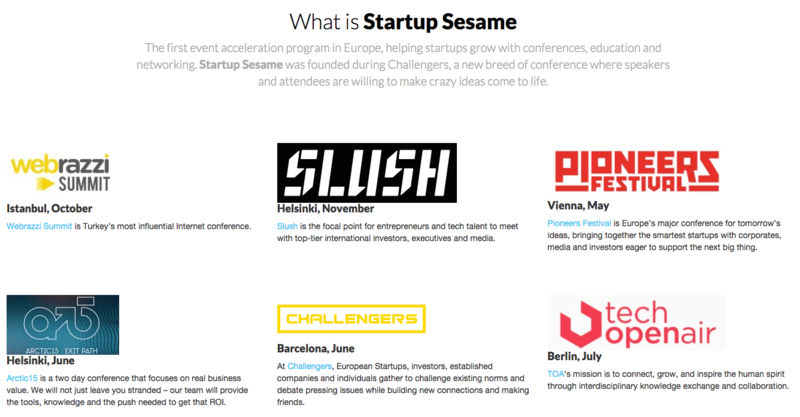 You may have picked up on its launch this week, but it’s worth highlighting given the sheer amount of technology events that are happening across Europe throughout the year: there’s a new ‘event acceleration program’ called Startup Sesame that gives European startup founders a chance to win or buy a ‘bundle ticket’ for six great conferences in various places. It’s all very simple, but also extremely valuable in my opinion, as (especially first-time) entrepreneurs don’t always know which event will provide the best bangs for their (limited) bucks. Startup Sesame lets founders apply online for a chance to be selected, up until 2 October initially. Five startups will then be picked, who win free access to six events: Arctic15, Challengers, Pioneers Festival, Slush, Tech Open Air and Webrazzi. The events take place between October 2015 and July 2016. Another 50 selected applicants get premium access to all these events for a one-off charge of €1,000, which is a very fair price – take it from someone who’s been to 5 out of 6 (sorry, Challengers). Interestingly, selected founders get more than just access to the events as well. The event organisers in the alliance have come up with perks for startups, including free or discounted exhibition space at the venues, stage time, pitching opportunities, social media boosts, press coverage, and more. In a call with Tech.eu, the folks behind Startups Sesame (Connectors, founded by ex-Le Web and Midem staffers Benjamin Costantini and Joanna Kirk) explained that the goal is to get even more event organisers on board for the initiative. There’s a page with Startup Sesame’s manifesto that lets other event organisers fill out a form, if you are interested. The goal is not to stay in Europe only, and expand the partnership globally, as well as to get the programs fully sponsored to travel costs for startups can also be covered.